1. This manifesto applies to all types of games. Yes, even sports. 2. Good games are about the player and the mechanics. Great games are about people and communities. The communities can be as large as all of civilization or as small as two people in a tiny room. 3. Games about mechanics and games about people are in no way mutually exclusive. A game can be profoundly complex in its mechanics and at its heart be about people and communities. 4. Demanding games (mechanically or otherwise) offer a special place to take risks and experience failure without material consequences. Embarrassment is one of the best experiences a game can give you. Embarrassment > Fun. 6. Most people play mechanically demanding games so they have something to talk about. Many people are in denial about this, and think they play them to experience mastery and dominance. 7. Mechanically demanding games that aren't inherently about people and communities will become about people and communities if they get popular, by people talking about them a lot. 8. 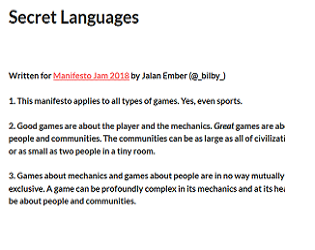 By learning to play a complex game, you are also learning a secret language spoken by the players of that game. 9. Languages should not be used as weapons. 10. Heartfelt conversation is easier when using a secret language. - Thinking about it for too long makes you misty eyed and/or pace the room. - You feel like you'll explode if you don't talk about it with someone. - Your face gets flushed while playing it. -When you're done playing it, you become aware of your own lungs.